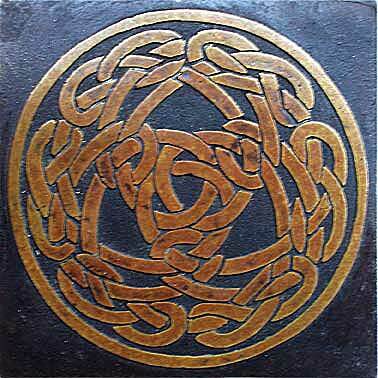 This bronze tile is the first in a series of three Celtic tiles I made in the summer of 1995. 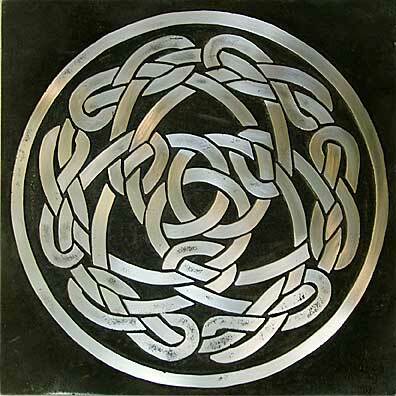 The knot is something I came up with a couple of years earlier when I first started working with Celtic designs. The significance of the knot is interesting to me. The outer ring is symbolic of Unity, Infinity, Perfection, The All, or Zero, The Nothing. The knot inside is made of two strands, which brings in the Male and Female, the Good and Evil, the Source and the Spawn, or any other dichotomies you can come up with. The three central knots gives rise to the name, and introduces the concept of Trinity, such as Spirit, Mind, and Body, or Birth, Life, and Death, or Age, Adult, and Youth, or a lot of religious connotations. 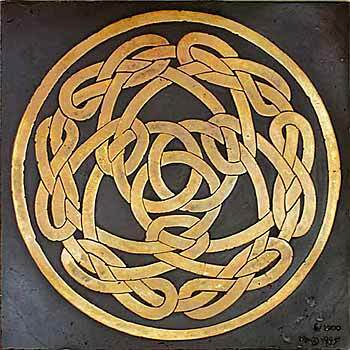 The knot itself, is fashioned after the pre-Christian influence, and so is pure in form, symbolic of "God," yet doesn't imitate any of "God's" works, not being embelished with animal or human figures like some of the later Celtic art which had the influence of the Romans and Christians incorporated into it. The tile, itself, is the same size as a normal 8" or 6" ceramic tile, so it can fit nicely into an entry way, kitchen back splash, above a fireplace, or inset into a rock wall bordering the drive. It can also be tapped and drilled and can be attached from the back. This option is an additional charge. The patina varies from tile to tile, and can be specified as to color and depth, within the limits of normal bronze colors, i.e. brown, black, gold, chestnut, and reddish brown as pictured in the first two tiles above. The bottom tile is how it looks with the black background patina applied and sanded off the knot portion to expose the raw bronze before the second patina is applied.